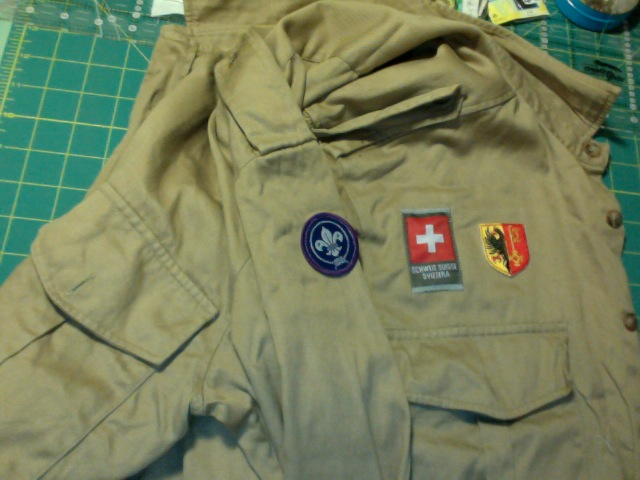 Scouting: it seems years ago that my mother sewed on my own badges, on my own rough brown shirt. Now, in a fun twist of fate, I am sewing on badges for my lovely neighbours’ children. I am definitely seeking the title of Queen of the Sewing Machine in this apartment building! Come to think of it, I rather suspect there is no competition at all. Sewing is hardly a fashionable hobby around here, as far as I can see. Come to think of it, maybe my kiddies might soon enjoy scouting? But, living in the centre of the city, this seems rather an odd idea. I associate it with running around in the wild woods. But wilderness, in the city, might be just around the corner. Who knows? You are very kind to help your neighbor. That scout will be proud to have the badges sewn on. You’re a great neighbor! Bless you heart. At the school where I work, Gstaad International School, we have just introduced a module entitled Life Skills and one of the skills will be sewing on a button (or maybe a badge)!